The common cold: Even though Americans have over a billion colds per year, there's nothing "common" about it when you've got one. The sneezing, the scratchy throat, the runny nose, the nasal congestion, and the watery eyes can make your life miserable. Even though most colds go away within three to seven days, there are steps you can take to boost your body's immune system and help get rid of your cold sooner than that. Read on for our "Top 10 Tips" on getting over your cold quickly, consolidated from healthcare experts all over the world. 1. First, make sure you've really got a cold. The symptoms listed above are those of the common cold, which is a disease of the upper respiratory tract caused by a number of different viruses. 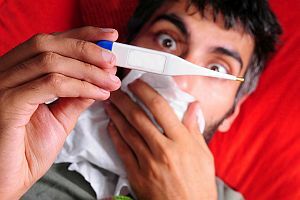 But if these symptoms are accompanied by more severe ones such as muscle aches, high fever, chills, headache, and fatigue, chances may be that it's not a cold at all, but the flu instead. This is important to find out, because if you have a serious case of the flu, you may need to see a doctor and take an antiviral medication like Tamiflu, which can shorten the length of the outbreak. However, if you've got a cold, not only will the antiviral medication be ineffective, it can even weaken your immune system in the long run. 2. Don't "tough it out"-stay at home and get some rest. Going to work will only make your cold last longer, and you can expose all your coworkers to the virus as well. So take a few days off and give your body the rest it needs to recover and heal faster. 3. Drink lots and lots of liquids, including-yes, really-chicken soup. Your mother's advice to drink lots of fluids was correct, as it turns out. Research has shown that drinking warm fluids helps to relieve the most common cold symptoms and also loosens sinus secretions that cause a buildup of mucus. Hot tea or broth is a good choice, as is coffee, which has been shown to increase alertness in people with colds. And interestingly enough, the centuries-old prescription to "Have a nice bowl of chicken soup." is also correct-it has been shown to be more hydrating and thus more beneficial than other liquids. 4. Gargle with salt water. Gargling with 1/2 teaspoon of salt dissolved in 8 ounces of water can help to relieve your sore or scratchy throat. 5. Use over-the-counter medications (very selectively) to deal with runny nose and coughs. A pharmacy has reliable saline nose drops or sprays and cough syrups that can help to make these cold symptoms more bearable, although they won't make the cold go away any faster. 6. Steam the cold away. If you have access to a steam bath, take one-or many. If you don't, you can improvise by leaning your head over a bowl of hot water or by taking a long, steamy shower. Inhaling warm, moist air helps to loosen and thin out mucus. 7. Boost your immune system with supplements. Research has shown that taking zinc supplements during the first couple of days may help shorten the duration of your cold and perhaps reduce its severity. But don't take zinc on an empty stomach, and don't use intranasal zinc nose drops or sprays; the FDA has warned that they can permanently impair your sense of smell. Vitamin C can also help to shorten colds, whether in supplement form or in fruits and vegetables. Echinacea, elderberry syrup, and raw honey have also been shown to shorten colds. 8. Avoid smoke and polluted air. Anything that affects your ability to breathe properly is going to extend your cold. 9. Don't reinfect yourself or others. Practice "safe sneezing and coughing" by covering your nose and mouth and carefully discarding any tissues you use. Wash your hands often and consider using hand sanitizers to keep from infecting family, friends, coworkers, and yes, even yourself. If you contracted the cold at work and others there still have their colds, avoid the place for a few days if you can until people get better. 10. Use over-the-counter pain relievers to reduce inflammation. Used in moderation, aspirin, acetaminophen, ibuprofen, and naproxen can all help relieve minor bodily aches that may accompany your cold, but they also act as anti-inflammatories and can reduce a fever and speed up the healing process. If you'd like to boost your immune system, give us a call at (303) 776-6767 and see how chiropractic care can help! What is a "Charley Horse?"